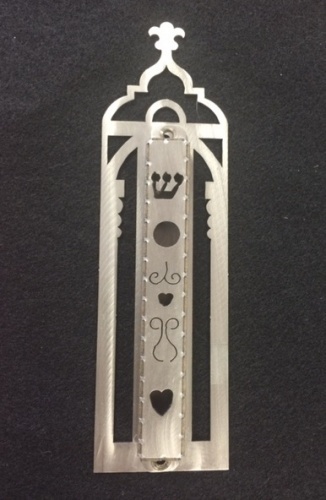 Two pieces put together to make the Synagogue Mezuzah. The bottom piece is the base with the shape of the synagogue. The top piece is laser cut with hearts, a circle and a Shin. This mezuzah will be able to stand up to the elements. Measures 1.75" at it's widest and 6" tall. Kosher scroll sold separate. This mezuzah can hold a large or small scroll. Amy's decorative accessories are a celebration of life in motion. they have an enchanting, captivation presence that can enhance any environment. Designed and assembled with an uncommon attention to detail, the achieve the timeless quality of fine art. Each piece is an expression of Amy's passion for life and art that's meant to be enjoyed everyday.